In a city with many churches known for their antiquity, history, religious significance and architectural grandeur, this one stands tall. Its imposing neo-Gothic design is enhanced by a series of spires, with the tallest rising to 155 ft. The colossal central area, stunning stained-glass murals and life-size portraits inside, and the slender towers and pinnacles outside, make it a huge tourist attraction. But, the cathedral’s significance goes beyond architectural beauty. The basilica is one of the three places associated with St. Thomas in Chennai. Legend has it that he landed in India in 52 CE and established churches on the West Coast before heading to the Coromandal coast and Madras. After his martyrdom in 72 CE, his disciples buried him in Santhome, and the church came up on the spot. Wrote Marco Polo: “It is in this province, which is styled the Greater India, at the gulf between Ceylon and the mainland, that the body of Messer St. Thomas lies, at a certain town having no great population.” The Portuguese arrived in the 16th Century, were shown the tomb by Armenian merchants, excavated it in 1523, found a few relics and rebuilt the shrine. By 1893, the church, again in disrepair, was demolished to give way for the present one. In 1956, the church was declared a minor Basilica. In 2002, in a further renovation, a new passage to the tomb from outside and a museum of St. Thomas memorabilia were added. The spear that killed the saint, stones that have deeds of St. Thomas etched on them, and two postage stamps are part of the collection. The cathedral became a centre of conversation when the tsunami that devastated areas all around left the newly-renovated church untouched. Folklore has it that St. Thomas had mounted a log of wood at the top of the steps leading to the Cathedral saying the sea would not pass that point. People believe this “miraculous post” kept the sea away that fateful day. 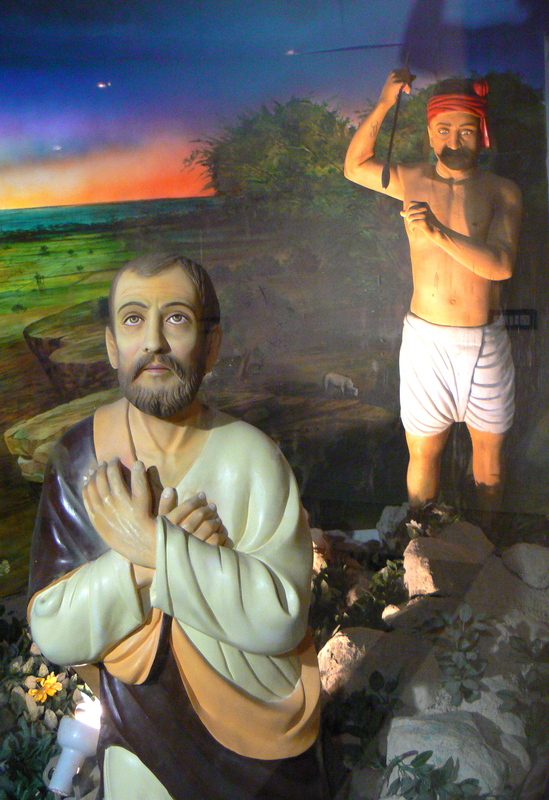 The story of St. Thomas’ association with Chennai begins in a tiny cave in Little Mount (Chinnamalai) at Saidapet. The apostle is believed to have lived and preached here. The cave’s mouth is about 5 feet in height and one-and-a-half feet in width. Another opening supposedly leads to a tunnel through which the apostle is believed to have escaped his assailants. The clear palm print near the tunnel’s entrance and the footprint at the foot of the hillock are believed to be those of St. Thomas. The freshwater spring nearby is supposed to have appeared miraculously to quench the thirst of his followers. A portrait of St. Thomas, a Portuguese inscription, a tiny church built by the Portuguese in 1551 and a masonry cross at the top of the hill add to the place’s importance. A new circular modern church dedicated to our Lady of Health, has been built to commemorate the 19th Century of St. Thomas’ martyrdom. A flight of 160 steps, built by the Armenian merchant Coja Petrus Uscan, leads to the top of St. Thomas Mount. Here you get to see what is believed to be a piece of St. Thomas’ bone and the “bleeding” cross, that legend says was carved by St. Thomas himself. It is while he was praying before it that he is said to have been martyred, and it was stained with his blood. This Cross was discovered in the 16th Century by workers digging to lay the foundation for the Church. People believe it sweated blood on December 18 every year from 1551 to 1704 AD. The reason we have taken issue with Geeta Padmanabhan’s article in The Hindu is because The Hindu’s editor refuses to allow any dissenting view or counter comment to the article. We know of half a dozen readers who have commented on Geeta’s article but have had their comments deleted. This prejudiced editorial position of The Hindu vis-a-vis the St Thomas myth is not new. We have had three editions of our study of the St Thomas myth rejected by The Hindu’s editors, in 1991 when it was first published, then again in 1995 and 2010 when these later expanded editions were sent to the paper for review. This deeply discriminatory attitude of The Hindu is equally true of other mainstream newspapers, namely The New Indian Express and The Times of India. All of them publish St Thomas stories and all of them refuse outright to consider the actual historical evidence against St Thomas’s mission and murder in India, or the evidence for the destruction of the original Kapaleeswara Temple on the Mylapore beach and the building of the first San Thome Church on its foundations by the Portuguese. The whole fable is exploded by the fact that the complete skeleton of St Thomas has been in the possession of the Ortona Basilica (Basilica-Concattedrale di San Tommaso Apostolo) in Italy since the 12th century. Therefore the Portuguese could not have found any bones or spear heads or pots of blood-soaked earth in the royal tomb—allegedly of a Chola prince—they opened in the 16th century! Obviously this is a reference to the Gulf of Mannar between India and Sri Lanka, not the Mylapore beach area that is now called Santhome. All told Marco never visited India. He is only repeating the fanciful tales of Syrian Christian merchants that he met in Constantinople. Why are intelligent, educated, and cultured South Indian intellectuals so reluctant to tell the truth of history and the fact that the Portuguese imposed the St Thomas tale on Mylapore by force and fraud, that they totally destroyed Mylapore as far as their ships’ cannon could reach—about 2 kms inland—and then “restored” the town with their St Thomas churches built over ruined temple foundations? Why? This entry was posted in christian mythology, history writing, indian christianity, madras-mylapore archdiocese, mylapore, st. thomas and tagged christian myth, indian history, little mount, saint thomas, santhome cathedral, st. thomas in india, st. thomas mount. Bookmark the permalink.